A lot of you have been asking me for knife recommendations, and I thought it would be easier to direct you to a post on my site instead which would have a variety of options. I will preface this by saying that if you are a serious cook, and want a really good knife to last you a lifetime, I recommend you going to a store in person and feeling the knife in your hand. This is important because a knife is an individual type of purchase and investment. What may feel heavy in my hand, may feel just right for you. Likewise, if you are left-handed versus right-handed, you may might like the feel of a different knife. Some general stores are Williams-Sonoma, Sur La Table, and Macy’s. However, if you are near New York City, I highly recommend J.B. Prince Company They are a small Chef tool and equipment store located on the 11th floor of on office building, and they are known as the go-to place for serious cooks. They will truly help you through your purchase. On the other hand, if you are a home cook who just loves to cook, but doesn’t have a budget to really invest right now, you can take a look at the links below. I put a variety on here, but if you don’t see something you are looking for, just ask and I will add it. 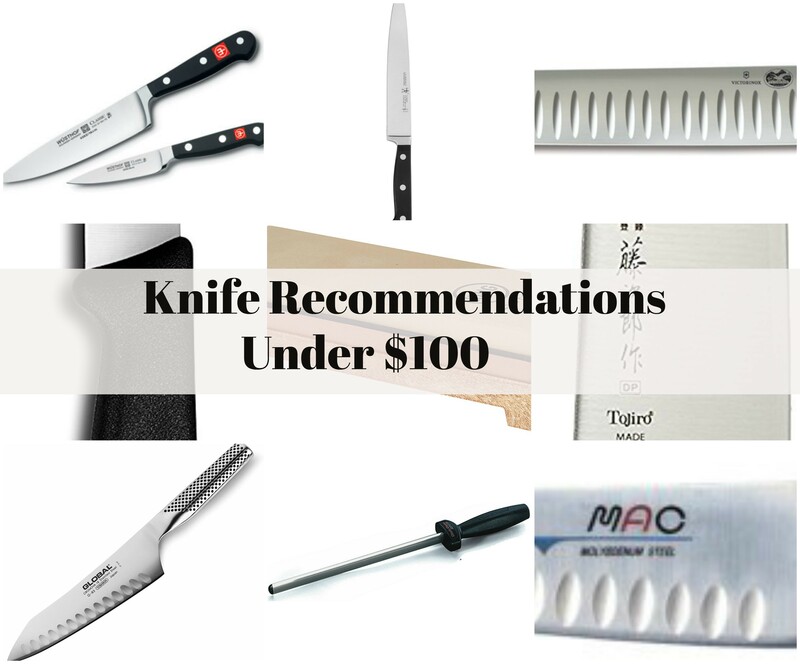 These are very decent knifes that are value brands and considered entry-level. Some may be stamped knives versus forged, which basically means that it is stamped from a blank piece of steel and then polished, shaped and sharpened. A forged knife has been put through the forging process which goes through extreme heating and cooling and essentially makes the steel stronger. There is some controversy on this topic, and I think that the bottom line is your budget, because at the end of the day, as long as you take care of your knife, it will take care of business. As a full disclosure, I have my amazon affiliate links below. That just means that if you decide to purchase anything, I would receive a small percentage of the sale at no additional cost to you. This helps run my blog, and keeps my recipes and tips and tricks I share, free. For under $30, you can’t beat this. A slicing knife is not something you’ll use very often, but when you do; you want it to do a good job. Whole chicken, beef roasts, turkey, etc. It’s 8 inches long. Victorinox is a brand that is better known for their swiss army knives, but also make very decent cutlery. This is a bit larger, coming in at 10.25 inches. The granton blade improves the meat separation and helps you slice more efficiently. At the time of this post (12/10/17) This Chef knife and paring knife costs 1 cent more than buying the chef knife alone, which is why I am linking them together. PLEASE NOTE: the Chef’s knife is only 6 inches, so keep that in mind. This is a strong and classic company, and I have used these multiple times throughout my culinary career. This is a lesser known brand name, but a really good Japanese style Chef knife. I have had a couple mac knives throughout my cooking in restaurants, and they are extremely sharp and lightweight. To be honest, I am not a huge fan of global knives, only because I don’t love the grip and feel in my hand, and I personally have a hard time sharpening them,HOWEVER, I would be remiss not to put them on the list because they are well made knives and many people I know use them and love them. This is a great value for this Gyutou knife. Gyutou is a Japanese designed Chef knife. It’s a very versatile knife that is lightweight and works well for right and left handed people since it’s even edged. Lastly, I wanted to add another Western style Chef’s knife; and I like that this one has the dimples in the blade so it’s different from the classic listed above. It’s also lighter than the classic but doesn’t sacrifice on strength. Coming in under $100, it’s a great knife for home cooks. Unless you are working in the food industry, I don’t think it’s necessary to spend a lot on a paring knife. There is not much a Chef’s knife cannot handle, but for smaller jobs;,a paring knife comes in handy. Peeling and cutting up small fruit, scoring tomatoes, prepping smaller vegetables and segmenting citrus are all things you will use this for. This is by far, the best and most inexpensive pick. I cannot write about knives and not include a honing steel and sharpening stone! These are crucial to keeping your knives in great shape. If you cannot afford to invest in a whetstone, or are not ready to use one yet (More on that later) then at the very least, get a good quality honing steel. This won’t sharpen your blade’s edge, but it will realign it, and it will appear sharper until you can sharpen it. I like (and use) a diamond steel. It’s diamond shaped and I find it safer to use. It also has diamond grains applied to the surface which give it an optimum edge. There are tons of whetstones out there, and as you get more serious, you will do more research, but this is the stone I have and it works very well. I use the 1000 grit to start, which grinds off some metal (as the lower numbers are coarser just like with sandpaper) and then I finish off on the 6000 grit to polish off and I love it. I don’t have a base, so I just put it on a wet towel and it works fine. This link has the base included and it’s not very expensive. As always, feel free to reach out with any questions. I love to share this information and hopefully make you feel more confident in the kitchen.